This week's big find comes from an unexpected direction. It's not often I bend my ear towards Quebecois folk music, but right from the startling vocal opening track "La Turlutte du Rotoculteur" (Google translation: "The jigger of Tiller" -- ?) 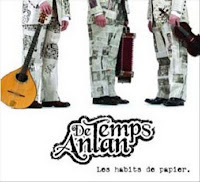 this second album from De Temps Antan is a riveting tour de force. I'm desperately trying to spin a clever line involving rock-paper-scissors, as the name of this album translates as "Paper Suits." And these guys rock in their own folky way. It's just not coming. The aforementioned suits are pictured prominently on the three serious looking musicians, lending an air of the surreal and unexpected. In truth, though, the group steers clear of cultural mashups and instruments, sticking to the Quebecois vocal and musical traditions they plied as part of the multi-platinum folk band La Bottine Souriante. The trio -- fiddler/vocalist Andre Brunet, accordionist Pierre-Luc Dupuis, and guitar/mandolin/bouzouki player Eric Beaudry -- easily hook the listener with their musical skill, and the clear joy they take in making this music. 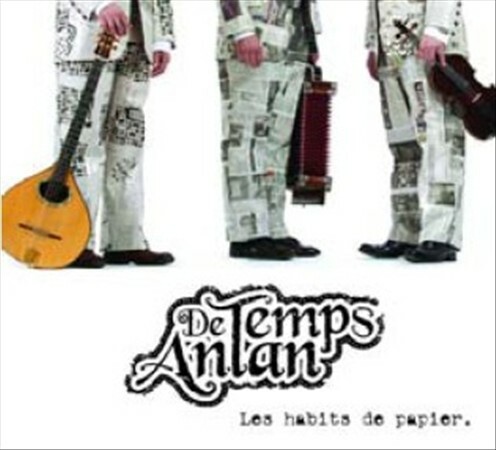 Les haibits de papier is a great case of the music speaking for itself, unassisted by clever cultural angles or even -- at least in my case -- any expectations based on knowledge of the musicians' backgrounds. Perhaps the CD's lack of lyrics or liner notes (or even the musicians' names and instruments) is also intended to steer you to a pure listening experience. Intended or not, that's the effect. The songs vary significantly, from a cappella, to vocals accompanied only by drum, to full-blown numbers like this one featuring jaw harp, slide guitar, and harmonica along with strings and vocals.